Sound Transit will hold an open house on June 27 where participants can get an update on progress of the Lynnwood Link Extension project. Recent Lynnwood Link design refinements focus on reducing costs without compromising fast, frequent and congestion-free service for riders. Wednesday, June 27, Shorewood High School, 17300 Fremont Ave. N. 6-8pm. The 8.5-mile light rail extension from Northgate to Lynnwood Transit Center is currently in the final design phase. At the event, participants will learn about the new cost-efficient station and project designs as well as ongoing work to secure critical federal funding and start construction, scheduled for early 2019. Individuals unable to attend an open house in person can view meeting materials online and provide comments at lynnwoodlink.participate.online. 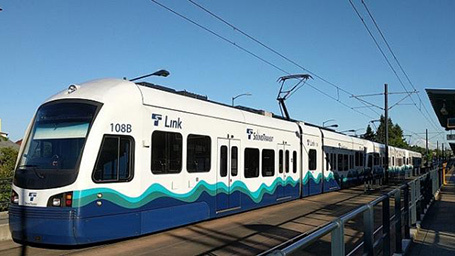 When Lynnwood Link opens in 2024, trains will serve four stations along the route at Northeast 145th Street, Northeast 185th Street, the Mountlake Terrace Transit Center at 236th Street Southwest, and Lynnwood Transit Center at 48th Avenue West. The project includes a total of approximately 1,500 additional park-and-ride spaces in the corridor. Commuters from Lynnwood Transit Center will enjoy 13-minute rides to Northgate Mall, 20-minute rides to the University of Washington, 28-minute rides to downtown Seattle and 60-minute rides to Sea-Tac Airport. Trains from Lynnwood will also serve the eastside and reach downtown Bellevue in 51 minutes and the Overlake Transit Center in 60 minutes from the Lynnwood Transit Center. More information on the Lynnwood Link Extension is available here. In addition to the Lynnwood Link Extension, Sound Transit is simultaneously working to extend light rail to the south, east, west and further north, opening new stations every few years to form a 116-mile regional system by 2041. The agency is on track to open extensions to Seattle's University District, Roosevelt and Northgate neighborhoods in 2021, followed by service to Mercer Island, Bellevue and Redmond's Overlake area in 2023. Additional extensions to Kent/Des Moines, Federal Way, and Downtown Redmond are planned to open in 2024. Further light rail extensions are scheduled to reach West Seattle and the Tacoma Dome in 2030; Seattle Center, South Lake Union and Ballard in 2035; Paine Field and Everett in 2036; and South Kirkland and Issaquah in 2041.